As part of the Landell Mills contract ‘Visibility of the EU in Tanzania’ we have teamed up with Ubongo Kids (http://www.ubongokids.com/), on behalf of the European Union in Tanzania and the East African Community. Ubongo Kids is a Tanzanian edutainment programme and together we have created an episode of their weekly cartoon programme to educate children about energy efficiency. The episode titled ‘Kids for A Cleaner Future! /Watoto kwa Nishati Safi!’ has recently been broadcast on TBC in Tanzania in Kiswahili and English reaching over 1.5 million families. It will also be broadcast in other countries including Rwanda, Uganda and Kenya. It is 25 minutes long and made up of animated stories, catchy original songs and familiar Ubongo Kids characters. The episode highlights the EU’s commitment to help mitigate climate change. 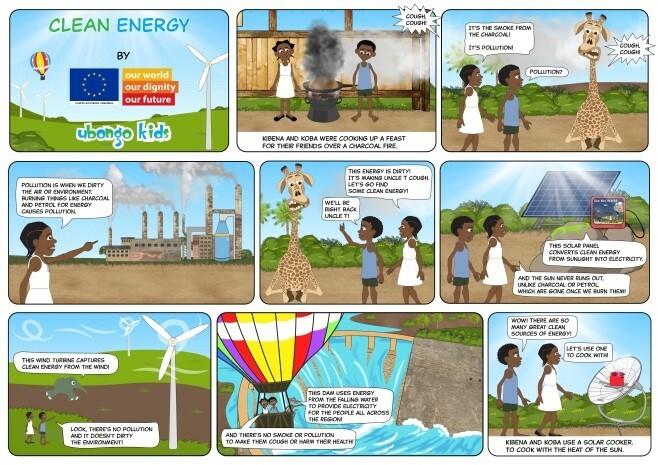 The two stars of the cartoon, Kibena and Koba, learn about the difference between ‘dirty’ energy and ‘clean’ energy. Together, they are committed to educate the elders around them about the dangers of dirty energy. They start exploring what energy efficiency and sustainable energy methods are and how they can use them in their daily lives. Please click to see the trailer in Kiswahili or English. Please click to see the full episode in Kiswahili or English.